Enjoy a number of stunning live webcam views overlooking the Forth Road Bridge, and the historic Forth Rail Bridge. The two Forth Bridges span the Firth of Forth in Central Scotland, linking and connecting, Edinburgh in the Lothians to the Kingdom of Fife. The Forth Road Bridge is 2.5 km in length and approx 2 million cars and vehicles cross the Forth Road Bridge every month. The Forth Road Bridge web cam is located on the South side of the suspension bridge, the Edinburgh side of the Firth of Forth, and shows a number of live traffic cam views to allow commuters in Central Scotland to see how busy the Forth Bridge commuters traffic is. Only three years to go, from today’s date, 27th July 2009, the London Olympic Games will be officially opened for the 2012 London Olympic Games in London, England. The London Olympic Games starts on the 27th July 2012. Only 1096 days to go from today’s date. Follow the progress with the construction of the 80,000 all seater Olympics Stadium by viewing this live construction webcamera overlooking London’s new Olympics stadium at the Olympic Park in Marshgate Lane, Lower Lea Valley in London. Enjoy live webcam views overlooking the construction of the new 2012 London Olympic Stadium in London. Check out live online coverage this Saturday night, 25th July 2009 at 7.15pm BST to approx 10pm BST of the main event of the Scotland Homecoming year, the Scottish Gathering Clans parade up Edinburgh’s Royal Mile in Scotland. Catch this spectacular event, of this Scotland Homecoming Clan Gathering, by viewing live webcams on the Royal Mile in the heart of Edinburgh. Enjoy live online video streaming web cam coverage of the showcase event of Homecoming Scotland - The Gathering of the Clans. Millions of Scottish Expats from all over the globe will be wishing and wanting to be in Edinburgh, on Saturday night, to watch the world’s largest ever Scottish Clan gathering on the Royal Mile in Edinburgh. Enjoy a live webcam tour in Berlin by viewing this live video streaming Berlin webcam in the heart of Germany’s capital city – Berlin. Great live webcam views – daytime and nightime. 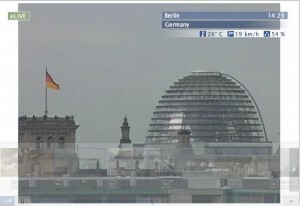 Enjoy live Berlin web cam views overlooking the Berlin Television Tower ‘Alex’, the German chancellors residence, and the Reichstag, a spectacular glass dome building in the city centre of Berlin in Germany. Check out the webcam views overlooking the historic Brandenburg Gate, in the heart of Berlin, as well as live cam views overlooking other areas of the Germany’s Parliament building – The Reichstag. Scotland’s largest outdoor music festival, T in the Park 09, starts today, Friday 10th July and finishes on Sunday night, 12th July 2009. T in the Park is one of the major outdoor music festivals in the UK. Over 85,000 UK music fans will be visiting the T in the Park fest every day. 65,000 T in the Park fans will be camping at the Balado airfield, the home for T in the Park, in Kinross shire in central Scotland. Also watch the T in the Park festival-goers party at Scotland’s largest outdoor music festival by viewing the live music festival web cam. Hopefully T in the Party festival-goers won’t be rolling in the mud at the Balado airfield. If you get bored watching Big Brother on the telly, then why not switch online to watch the St Christopher’s Live streaming video cam inside a backpackers dorm at the Village hostel on Borough High street in central London. Much more fun watching online live web cam coverage inside The Village backpackers dorm on Borough High street than watching the boring and drab Big Brother television programme. The live streaming audio webcam is inside Dorm 9 at St Christopher’s Inns – Borough High street backpackers hostel in London. Up to 14 backpackers, male and female, stay most nights in Dorm 9 and are happy to be filmed LIVE, via a infrared webcam with streaming audio, to be viewed on the world wide web. Viewing the St Christopher’s Inn’s Dorm 9 backpackers web cam is 100% FREE to webcam watch. The Hostel webcam operates 24 hours a day, 7 days a week. One word of warning – It can be quite addictive watching the Dorm 9 Hostel webcam. Speciall late at night or first thing in the morning. More exciting than watching Big Brother on the telly. Enjoy viewing this live streaming video webcam overlooking the Fourth Plinth living monument LIVE on London’s Trafalgar Square. The Trafalgar Square Fourth Plinth living monument project has been set up by scupture Antony Gormley. For 100 days, starting from Monday 6th July 09 till Wednesday 14th October 2009, members of the UK public, aged over 16 years old, can occupy the empty Trafalgar Square Fourth Plinth for their 60 minute moment of fame. Every hour, 24 hours a day, for 100 days without a break, a different person, every 60 minutes, will make the Plinth their own, to showcase their living art performance.